1. When is this released? 3. Will this run on Nokia N8? Alot of cars! like Lamborghini Countach 25th Anniversary and more! Very good graphic! like Xbox 360/PS3 games! Jesus Christ, the game just came out. But my dad just gave me Nokia N8 and my old phone was Nokia 5530, and an Android may be good but it has it's own limitations. Sadly no... And this game is pretty annoying. Asphalt is the Call of Duty of cars. 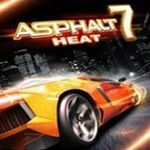 davidmanoy wrote Asphalt 7 still Ruffs? Lucky for you, they do have F40's now. Just no screenshot yet. Finally out now for Android too. Brought this game for my iPad and it's aaaaaaweeeeesooooomeeeeee!!! There is no damage. Like textures/models. The cars just bounce on the track after a crash. Suokukko wrote There is no damage. Like textures/models. The cars just bounce on the track after a crash. I don't know about you, but I could be one of the only few who still highly enjoys the Asphalt games. They may be simple arcade and it's insane that it's gone to 7 already, but there's something about them that keeps having me come back. They are the closest we have to the old Burnout games, on a portable device. And you know for sure that they will always have the same arcadish gameplay, loads of cool exotic cars and tracks, and you'll play them for a long time. So you pretty much can't go wrong when you decide to get one of the Asphalt games :P But yeah, there's probably no reason to have all 7, you just get the ones with the most appealing cars and tracks. XThUnDeRX wrote I don't know about you, but I could be one of the only few who still highly enjoys the Asphalt games. They may be simple arcade and it's insane that it's gone to 7 already, but there's something about them that keeps having me come back. Count me in. I enjoyed it too, simple and fun. Though I'd prefer the Asphalt 6 Adrenaline than this, but this one still a fun to play. Yep, I will add them. But I can't unlock XKR-S Convertible. There are no Special Events right now. Ferrari F12berlinetta, McLaren F1, Ferrari 575M Maranello, Lotus Exige S, Shelby Cobra, Peugeot RCZ R, Mercedes-Benz C-Class Coupe, Lotus Evora S.
And they all only unlockable with Special Events. Any better than Asphalt 8?